The closer we got to home the harder it rained. We parked the truck and trailer in the driveway of our house around 2:00 am. Oh Yeah … I missed the drive a little. The heavy trailer was stuck in the ditch and blocking half of the road. So I got a jack and some heavy boards and managed to get it back into the road. The second time I got it into the drive! ! ! 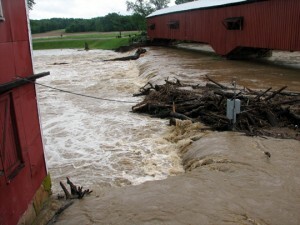 When we went to the mill the next day and the Big Raccoon Creek was flooded. It had been the biggest flood ever recorded in this area ! ! ! Fortunately for us the Cecil M. Harden Reservoir (Raccoon Lake) had been built upstream in 1959 – 60. So, we were protected from most of the water. Unfortunately, it had washed in a bunch of trees, logs …. etc. But, a few days later it started to rain again and the water had no place to go but the creek. This time the water got even higher than the first time. It washed out a few logs but washed in a lot more. Now let me back up the story a bit. In Feb 2008 we had a big flood. It washed in hundred of trees, logs …etc. 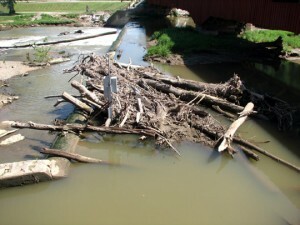 They were stacked like Pick -Up – Sticks from the dam to almost the concrete bridge. We (me and several local friends) worked from early April until the end of May clearing the dam and mill pond. Then Karen and I went to Mich. the first of June. When we returned it had filled up again.